Code Pink award winner Helen Thomas attacked George Bush and American forces in Iraq during her latest rampage at Franklin & Marshall’s Alumni Sports & Fitness Center in Lancaster, Pennsylvania on Friday. 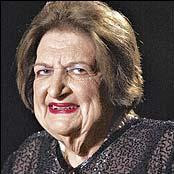 It was uncomfortable being a reporter in Helen Thomas’ audience Friday night. But it would have been a lot worse being President George W. Bush. After 57 years as White House Bureau Chief for United Press International, Thomas speaks with the concise, no-holds-barred frankness every reporter desires from a source. And every delightful sentence is quoteworthy. Sponsored by the League of Women Voters of Lancaster County, “An Evening with Helen Thomas” used a question-and-answer format, with the questions coming from Sunday News Managing Editor Barbara Hough Roda. Thomas was no more generous to today’s media, who she said canned tough questions at the outset of the war because of patriotism and fear — and in deference to editors who told them not to rock the boat. Oh, and they might have been gung-ho for a few weeks at war so they could come back real “war correspondents.” In fact, she said she couldn’t name even a single standout reporter.